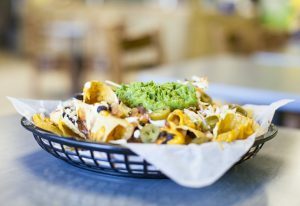 Point Pleasant-based Mexican restaurant Bubbakoo’s Burritos is expanding its influence both inland and along the shore with five locations slated to open in 2019. Its first two out-of-state locations are slated to open as well, in Rockland County, N.Y. and Staten Island, N.Y.
A location in Mount Olive is slated to open the second week of February, to be followed by locations in Parsippany, Manahawkin, Belmar and West Freehold. Last week, Bubbakoo’s nabbed the 498th spot on Entrepreneur Magazine’s Franchise 500 list, the world’s most comprehensive franchise ranking, and a No. 9 ranking in the Mexican restaurant category. Altero and Hart met working at a Johnny Rockets in Albany. N.Y., and started Bubbakoo’s in 2008 after 10 years of climbing the corporate ladder at the California-based burger chain. “We want people to enjoy their time,” said Hart, who helped establish the hybridized skater-surfer atmosphere offered at the chain. Their unique protein offerings, like General Tso’s crispy chicken, ghost pepper chicken, and shredded pork keep customers coming back, Hart said. Their innovation also appeals to landlords, according to retail broker Gary Krauss, who represented them in establishing the Mount Olive location. The next location will open in the Village Green Shopping Center at 100 Route 46, in the Budd Lake area of Mount Olive.